Swami Amritaswarupananda Puri, Vice-Chairman of the Mata Amritanandamayi Math, represented Sri Mata Amritanandamayi Devi in UAE at Abu Dhabi’s historic ‘Global Conference of Human Fraternity’. The conference, that aimed at nurturing brotherhood and tolerance between religions, based on the understanding that all faiths were founded to create peace for humanity, concluded with a historic meeting between two of the world’s most prominent religious leaders: His Eminence Dr. Ahmed El-Tayeb, the Grand Imam of Al-Azhar Al-Sharif and Chairman of the Muslim Council of Elders, and His Holiness Pope Francis of the Catholic Church. The conference was attended by more than 700 religious leaders as well as a number of prominent intellectual, cultural and media figures from around the world and addressed three main themes: ‘Principles of Human Fraternity,’ ‘Common Responsibility to Achieve Human Fraternity’ and ‘Human Fraternity: Challenges and Opportunities’. 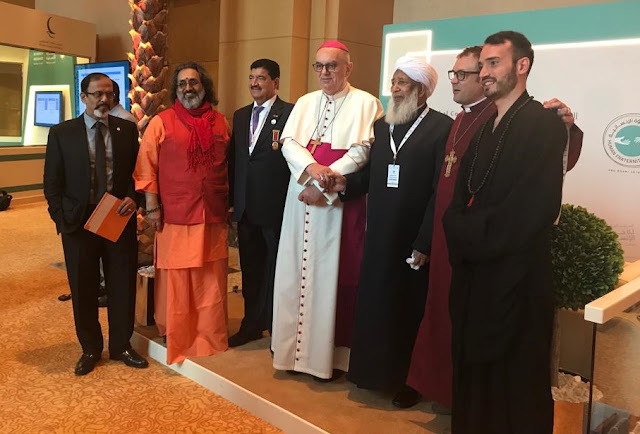 This was Swami Amritaswarupananda’s second interfaith event in Abu Dhabi since November last year, when he accompanied spiritual leader and humanitarian Sri Mata Amritanandamayi Devi to the Abu Dhabi Interfaith Summit aimed at Protecting Child Dignity in the Digital World.